Sean Penn. Emile Hirsch. Josh Brolin. Diego Luna. James Franco. Victor Garber. Drama. Biopic. Civil Rights. Politics. Gay Interest. True Stories. 1970s. 01 Ade tastics. Romance. 01 Nigel's Choice. Rob Recommends. 01 Tara's Midnight Movies. Recommended. 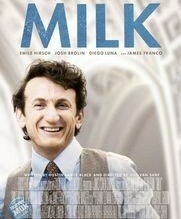 An intelligent, thoughtful, highly engaging biopic of Harvey Milk, the San Francisco based idealist, who became the first openly gay activist to run for political office in the US. Before his assassination Milk was a leading cog in the battle for civil rights for the gay community, as in the 1978 fight against Proposition 6, which could have banned gay and lesbian individuals from teaching in schools. The story may have been a terriby tragedy, but the tone of the movie is upbeat and vibrant, Gus Van Sant directs with unflashy simplicity and Sean Penn dominates as an everyday man driven by the simple desire for equality and justice.